Fabulous Baby Sweaters, Toddler Sweaters, Newborn Sweaters, Baby Hats, booties, Blankies and Gifts- Unique, creative, Handknit, Handmade! Ordering our customized card & wrap is easy! Just click 'Make it a Gift' at checkout! Sold out! Thanks for visiting - we'll be back next fall with all new styles & colors! The incredible yarn shown above can be found at the online yarn store for fiber fanatics- fabulousyarn.com. 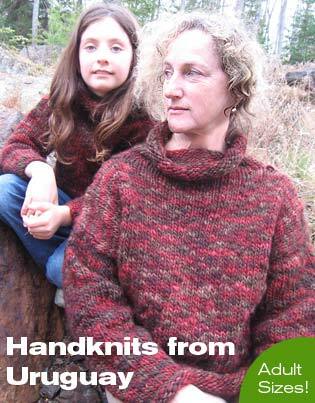 Fabulous yarn is the place to find yarn and knitting patterns to knit the roll top sweaters shown above. Please check out our beautiful yarn from Artyarns - mohair luxury yarn that is handpainted and lovely! Please note - due to overwhelming demand, FAB is processing orders by hand, one at a time! Your order will not be fulfilled or charge until we have VERIFIED that we actually HAVE what you want! Our new Cotton Spring Sweaters sweaters are on the way - beautiful organic cotton in luscious colors! Luxury baby gifts and new baby gifts . One of a kind - one at a time. Cuddly handknit baby sweaters in alpaca • Warm & Wonderful childrens sweaters in Merino Wool • Unusual baby sweaters in sizes from newborn to Big Kid (4T/5T). Searching for a unique baby shower gift for a newborn or baby shower? 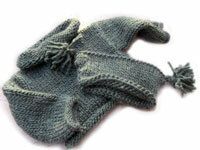 A handknit baby sweater so creative and special. And we make great handknits for newborns - teeny little sweaters to keep those teeny little bodies warm and fashionable! Rita's Baby Layette is the "Ultimate" in Baby's Coming Home Attire. Shopping site offering parents a great choice of natural pregnancy, baby and child toiletries. Looking for more Great Toddler Sweater, Baby Sweater and Hand Knit Sweater stuff? Gorgeous, stylish sweaters and gifts in cashmere, and some cottons, too! Find free offers for catalogs, clip art, software, baby stuff, genealogy, crafts and craft patterns, coupons, and much more!